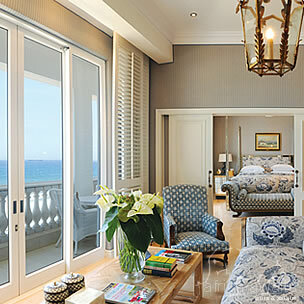 Perfectly situated on the ocean’s edge, a brief 5 minutes walk from Umhlanga Village Centre, the Oyster Box Hotel is conveniently located for quick and easy access to Durban city centre, International Airports and numerous stylish shopping centres…yet has a feeling of classical charm and elegance like nowhere else on earth. For those wishing to play a few rounds on some of South Africa’s finest fairways excellent golf courses are a mere minutes drive away. This iconic landmark has been lovingly refurbished to offer guests a vibrantly contemporary experience, whilst still evoking feelings, memories, and the warm nostalgia of days gone by. Meticulous attention to detail ensures that former guests will be delighted to discover the old glory has not just been retained, but carefully enhanced. All of the warm hospitality and gracious elegance which guests so fondly remember are harmoniously blended with a wealth of modern facilities and contemporary touches to satisfy today's most discerning of tourist, business person and honeymoon couple. The setting, the architecture, the décor, the cuisine – everything conspires to create a magical experience that affords a wealth of exceptionally pleasurable experiences and warm memories. Whether it's a complimentary glass of Oyster Box's signature homemade lemonade, cranberry juice or a glass of sparkling wine which welcomes you on arrival, a relaxing treatment in the beautifully designed Oyster Box Spa, the way your children and pets are made to feel immediately at home, the chef's inspired selection of culinary delights, complimentary transfers to the nearby shopping centre, or that long cool cocktail on the Oyster Bar terrace at the end of another blissful day under African skies, there’s no shortage of special moments you’ll fondly remember for a lifetime. The Oyster Box is a destination in itself where visitors and guests are spoilt for choice with an extensive array of exquisite services. * The Grill Room, famous in KZN for serving freshly caught seafood and Durban’s finest curries. * The Ocean Terrace Restaurant, with a Tandoori and pizza oven offers mouth watering Indian cuisine as well as European-inspired South African fare. * The charming Palm Court Restaurant, set in a spacious open courtyard with lush palms is perfect for casual dining and Traditional High Tea. 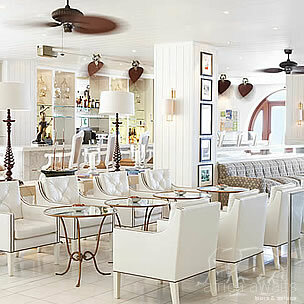 * The Lighthouse Bar, ideal for unwinding with exotic cocktails whilst listening to funky music and gazing upon the view of the ocean. * The Chukka Bar, with its authentic old world charm and character serves cocktails and fine wines. * The Oyster Bar, overlooking the pool and the Indian ocean, is a haven in which to enjoy freshly plucked oysters from our own oysters beds, chilled Champagne and mouth-watering snacks. * The Wine Cellar, offering the finest choice of local and International wines and a private dining option for up to 10 guests. * The 24 seater cinema and screening room to watch your favourite films whilst enjoying Popcorn, candies, ice-creams and rich drinking chocolate or a milkshake of the day served to you without missing a ‘frame’. * A holiday club for the children keeps the little ones entertained so that the grown-up can relax. 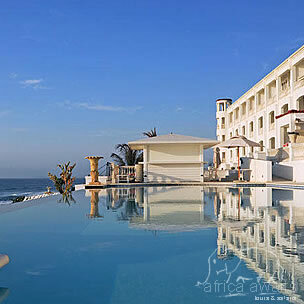 With your holiday, safari or business trip from in to The Oyster Box Hotel in Kwazulu Natal.